I took the bus yesterday. My friends in other cities are probably not so impressed, but in Louisville, this is kind of a big deal. It was mostly pleasant, as long as you don't try to read or play on your phone (I get motion sickness) and as long as you aren't in a hurry. That's not to say you can't get somewhere on time using public transport here. It's just that the bus is not going to come when the route planner says it will. As FWT says, it's either "ten minutes early or thirty minutes late." It's hard to say which. A tweet from him this morning reads "bus is to schedule as hippo is to rain jacket." The solution, I think, is just to relax and not worry about when you'll get there. That's not particularly helpful when you're going to work (as FWT this morning after one hour travel time from the Highlands to his downtown office, again most of which was waiting for the bus to arrive). I missed opening pitch of the Bats game last night, though I was at the bus stop 12 minutes before it was supposed to be there. The schedule told me I'd arrive 18 minutes early. The trip took -- from my house in the Highlands to Slugger Field -- a total of 50 minutes, but only about 20 of those were actually spent on the bus. Still, it was a really pleasant trip because I don't really care about baseball. Not having to park my car was surely the biggest bonus because there was both a Bats game and Waterfront Wednesday going on. Downtown was packed. Also, the last time I took the bus for transport here was two summers ago when I was car-free for a couple of months. After waiting at the stop 30+ minutes in 100 degree weather, I was swarmed and stung multiple times by sweat bees before I was able to run inside the Wine Market for shelter and chardonnay (confession: I actually despise chardonnay, but "shelter and chardonnay" sounded nice). I then called someone and got a ride, and I bought a car later that week. Maybe I've just got bad luck with the bus in Louisville. It really was fun once I was onboard, despite the woman behind me shouting into her cell phone. The seats were clean, the driver was super-helpful and friendly, and I loved seeing Bardstown Road from the view of public transport. Our city looks impressive from a tourist POV, and I love not having to drive. I just wish things here ran like they do in Japan or Germany. Well, the bus schedules anyway. Can we discuss some silly etiquette now? We all understand why you're not supposed to wear white as a wedding guest. It's a little bit dumb, but understandable nowadays, when one can never tell just how formal/traditional the bride is going to be. You wouldn't want to show up in a white tea-length sundress, when the bride is wearing the same thing (embarrassing for one, annoying for another). That rule about not wearing black to a wedding has fallen away because, well, that black is formal, easy, and looks good on everyone. But somehow you're still not really supposed to wear red to a wedding -- or rather, you should "use discretion." I remembered this trivial bit of etiquette last week as I put on a red & white floral sundress to wear to a friend's wedding. It's a pretty little sundress, and no one would have confused me with the bride. Still, I vaguely recalled the red rule and changed dresses just before leaving the house. I think it's just more anti-redhead discrimination. So I say to my own wedding guests who may be reading, feel free to wear red. Or white even. Just wear something loose because it's gonna be HOT! I got so many lovely responses yesterday, both public comments and private messages. Thank you all for your wisdom and kind words. It seems that from the beginning of all this, the single-most common (and best) piece of advice we've gotten is: do what you want, and don't worry about anyone else. That should seem obvious to us, right? Well, it's so much easier said than done, and it's been something we've had to try really hard to remember. Aside from the big problem that I have a terrible habit of wanting everyone to be happy, I really really don't want to anger people. And people have extreme opinions about weddings. We've already annoyed many folks by having a smaller wedding, with only family and close friends we see on a regular basis. That was purely the fault of our minuscule budget -- a budget that would make most wedding planners scoff. We're already over that wee budget, even with the limited guests. Most people seem to understand (at least to our faces). Still, when we win Powerball next week, we'll be quadrupling the guest list and the bourbon selection. Other choices we've made will probably surprise a few guests, but again: that doesn't matter, right? We are doing our best to keep things as Green as possible, and end the evening with as little waste as possible. Truly, though, I'm not worried about it anymore. I tried to spell everyone's names correctly on the invitations, and it'll be an open bar. Those are two things that matter to me. I have an on-and-off relationship with caffeine. In addition to having the same general affect on me as a few tequila shots, it messes with my migraines, hurts my vocal cords, and makes someone with a family history of breast cancer very confused during self-examination time. But somehow, every time I tour in the UK, I come home re-addicted to caffeine. I blame a combination of Scottish and Southern manners. My Scottish friends new and old offer me a "cuppa" the minute I see them, and being a polite Kentuckian, I don't want to be a rude guest. I certainly don't want to be the one who says, "Do you have anything herbal?" Aside from that excuse, I absolutely adore a "cuppa," especially when I see that cute little pitcher for the milk (never cream) and tiny spoons for stirring and extracting teabags. It's all so precious -- the ceremony, the electric kettles everyone seems to have, the atmosphere -- I simply cannot resist. Oh, does it taste delicious! And oh, does it work! I'm a chatty person anyway, but give me caffeine, and I will catch myself literally jumping up and down when something excites me. I apologize to all my British hosts. I should have warned you. When I finally got home, I bought some proper breakfast tea, not wanting to resort to the trouble that is coffee, and I have been daily weaning myself off the drug. 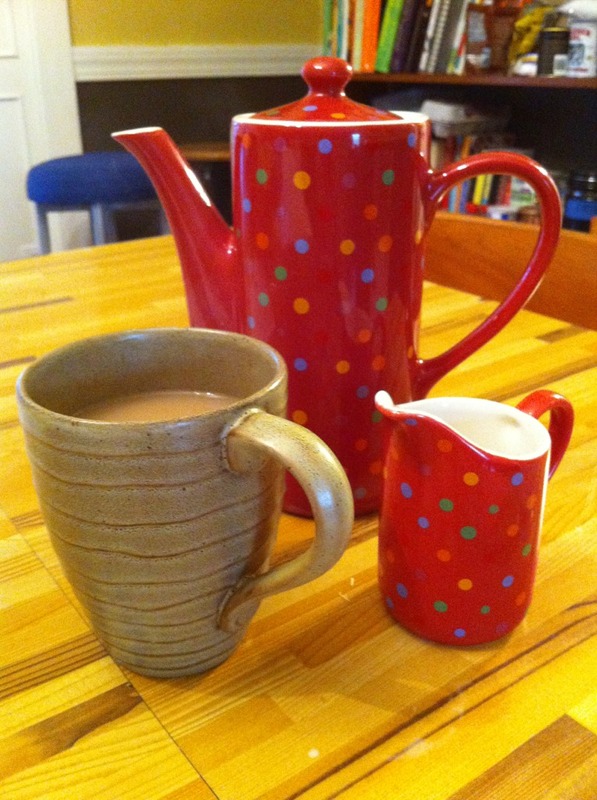 This morning I let the teabag steep for a mere 20 seconds in my adorable polka-dotted teapot (yay for wedding presents!). It doesn't taste like Scotland, but I'll soon be able to switch to the decaf breakfast tea I also purchased. Just in time for the next trip to Scotland. 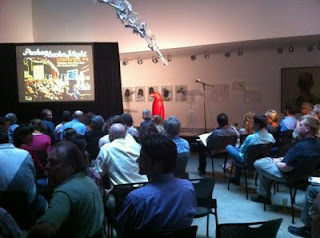 Inspiring PechaKucha Night at 21C ... the Mayor and 12 other Thinkers. In my travels, I always have trouble explaining to people just how exciting it can be to live in Louisville, and nights like last night at 21C reinforce how cool it is to live here. 21C Museum Hotel hosted Louisville's fourth Pecha Kucha event last night to a standing-room-only crowd. It was one of those evenings that made me proud to live here among such creative, innovative, and optimistic people. The Pecha Kucha started in Japan in 2003 as a way for designers to present new ideas in a forum as concise as a bento box, and the format has spread around the world. Essentially, twelve people are given 400 seconds each to talk to the crowd, each speaker accompanied by a timed PowerPoint that features 20 slides for 20 seconds each. There were lectures on architecture, there were ideas for community development, there were speeches on lifestyle changes, and there was a lot of brainpower. There was also the mayor, and Metro TV, lots of community leaders, media folks, artists, and tons of folks I don't know, all of who listened attentively and reacted in the most inspiring ways. I'm biased, of course, as my sweetie was one of the twelve presenters. Warning: here's the part where I gush about David. I'd never really seen him in his element. Usually I'm the one going on stage while he claps politely from the audience. But his "Creativity Fund" presentation was just fantastic, and I loved seeing the crowd's reaction when he spoke of cultivating and nurturing Louisville's innovation leaders in a real, i.e. pecuniary way. It was absolutely inspiring, and I think I wanted to vote for him for President of the Universe by the end of his presentation. But I digress ... there were loads of great presenters last night. Christine Brinkmann gave a wonderful talk about not just eating locally-grown food, but of teaching children about whole foods with gardens and cooking lessons. Documentary photographer Sarah Hoskins showed twenty black and white photographs, each with its own charming story. Ideas about developing the South End, driving less, crazy technology, and architecture galore, made the evening not just exciting, but well-rounded. It was like being in school, but without pressure and always with a professor you loved (and beer). I could go on and on about the different ideas, but what I loved most about the evening was how each brief lecture was conversation kindle. Intermission -- and may I say now how much I adore an event with an intermission?? -- was a time to discuss ideas with genuine excitement. I also stayed out WAY too late in the hotel bar sitting around with friends old and new just talking about the future and how we can make it great. Louisville isn't the only city with PechaKucha nights, but the popularity of the event here reminds me of what a great city it is. It also reminds me that I should go out more often. There are all kinds of events that offer the same kind of mental stimulation, from visiting an art museum to attending a rock concert. I'm thankful to live in a city that has so much to offer. Now I just need to start taking advantage of it. So what else is going on this week? I used to have excellent penmanship. I know this because I tried really really hard to copy the example handwriting in school, curving each letter precisely as the guidelines suggested. Today, I wrote two thank you letters before my sentences started to become illegible. I'm not going to write a diatribe about how technology is evil. I like technology. I think Benjamin Franklin would have invented the iPhone years ago had he lived longer, and Google has saved me many a call to the public library. But I sure do wish I could still write purty. I spent most of January getting ahead in my 2011 GoodReads Challenge -- a challenge I issued to myself to read at least fifty books this year. That month I read something like two books per week, escaping into novels that took me far away from the miserable Kentucky winter. Somehow, as we approach the half-way point in the year, I have managed to be merely "on track" for my goal, as opposed to be "way ahead," as I'd planned. I thought with my newfound love for my Kindle that I would read all kinds of books while on tour. Not so. I barely managed to finish the last book in "The Hunger Games" (about as challenging a read as "Twilight") while abroad, even though I'd read the first two in less than a week. Anyway, I'm currently trying to finish five books, ranging from "baby books" (as my dad refers to anything less than 500 pages) to classics I should have read in high school. "How the Scots Invented the Modern World" by Arthur Herman. Scottish folk remind me of Kentuckians. Whenever there is the most remote connection between Kentucky and something famous, we cling onto it with a proud fervor. Scotland seems to do the same thing. I like this book though because it's at least documented with history, rather than just "Thomas Edison lived here once." "Rebecca" by Daphne Du Maurier. Ugh. I've been trying to finish this book for well over a year now, as it was recommended to me by many as the perfect novel to read while traveling in the UK. I've been to the UK three times since starting "Rebecca," but am somehow only on chapter eleven. My English teacher BFF assures me it gets good after Chapter 15, but I'm struggling to care about this narrator. Also, it's not the romance novel that its sultry paperback cover implies. "Dragonfly in Amber" by Diana Gabaldon. More Scotland tales. I've been audiobooking this for many months now, and I'm so, so close to finishing. The narrator's accent always lulls me to sleep, so it's been a long journey. "The Help" by Kathryn Stockett. I know, I know, you read it last year. Good for you. I like it too. This one is a good treadmill read. Almost finished. I suppose if I fall behind in my challenge, I can just start counting all those travel books I devour, but I never mark them as read. Nor do I count cookbooks, even though I'll read them cover to cover multiple times. I love a good cookbook, but I think I have to stop adding "baby books" to my list. That's not really the point of the challenge. As much as I have difficulty answering the question "What kind of music do you play," I appreciate the need for labels. Imagine hunting for exactly what you want in any kind of store (clothing, music, book, hardware) without clearly distinguishable departments. It would be impossibly slow. Sometimes, however, it's nice to move impossibly slowly. One recent afternoon in Edinburgh, I went for a "wander" through the streets of the City Centre with two friends. We'd had a delicious vegetarian lunch at Henderson's Cafe (where the server looked at me strangely after I asked if the soup was vegetarian, as she mumbled, "Um, everything here is vegetarian." Delight!). Having already been to the famous Edinburgh Castle at least four times on previous trips, and being privileged to have two local guides, I preferred to just meander around the Old Town taking in the sights and not having to worry about finding my way home. It was perfect. We stopped in at the RSA -- the Royal Scottish Academy -- just when it was beginning to rain. This strategic move reminded me of something Isabel Dalhousie would do -- or perhaps had done, seeing as I read all of those Alexander McCall Smith novels in a span of two weeks this past January, during a fit of mid-winter's depression. I loved all of the books, but especially loved the parts when Isabel would discuss art or browse at the RSA. It's a museum, but then not exactly. There are works by contemporary Scottish artists, something that is supported -- believe it or not -- by the government. The building dates from the 1800s, brand new in European eyes, and is in the heart of the city, in the gorgeous gardens between the Old Town and the New Town. What struck me from the first room in the museum was how not one of the pieces of art had a little description panel beneath it. Instead, there was either a red dot or not, indicating whether the piece had been sold or not. At first, I found this frustrating. I was not an art history major, and despite having read many a book on the subject, I've never engaged in discourse about the strengths and meanings of visual art with anyone who knew better. There's only so much you can learn from a book. When I was staring at these sculptures, multi-media projects, watercolors, and photographs, I was struggling. What I should be seeing? Where should my eyes focus? Was the artist a woman? A man? A pauper? A spoiled child? Eventually, I found a small plaque in the entryway of each room. It spelled out -- usually in an overly deep way -- the artist's general process and philosophy and never an individual piece of art. But still, as soon as I read one of them, I regretted it. It turns out that I had a wonderful time browsing all the contemporary art without having known a single thing about the art or artist. I was able to simply enjoy it, or stare at it quizzically, or move on uninterested. That probably sounds harsh, or missing the point. But as an artist (albeit from a different genre), I'm not offended if someone misses a well-placed half-diminished chord or a clever slant rhyme in one of my songs. I just want them to enjoy it. Or not -- whatever it makes them feel, as long as it makes them feel something. Maybe it's not even that. Sometimes the goal of listening to music is to make you stop feeling something you'd rather ignore. Enough waxing philosophical. I think the point is that not feeling pressure to read the labels and understand it, freed me up to actually enjoy it. I've never been in an art museum like that before, and I loved it -- even if I completely missed the point. I actually wanted to buy one or two things, and found myself hoping that someday I'll be able to afford some original art. Although, again, that could have been me just remembering Isabel Dalhousie. While having dinner with a friend last week, she told me about visiting a wine shop in Italy where you bought a card to taste 25-shots of wine or something. You wandered around the store, tasting various wines, and narrowing down your favorites ... without a single price tag. Now these particular friends could have afforded any wine in the shop, so there wasn't the heartbreak factor to account for. Still, it turns out that without a pricetag to dictate their taste, their two favorite bottles were one expensive one, and the other? A twenty-five dollar newer bottle. She said the same thing about how freeing it was to not have the labels all around, influencing your judgment. It'll be difficult for me, but I think the next time I venture to an art museum, I'm going to ignore those little labels. Don't get me wrong, I enjoy critical thinking. But it's nice to take a break and see what you like without being told you should like it. The day after I got home from my wild night in Amsterdam, I went swimsuit shopping. You see, it's summer in Kentucky, which is much different than summer in Scotland. Summer in Kentucky means 100% humidity and 100 degree weather (that's about 38*C). Swimming is not just a pasttime; it is a necessity. Also a necessity for me this summer was what I like to call a "fashion suit." For a particular summer event I'm attending, I may or may not be wearing a strapless dress. (Sorry, Princess Kate, though I appreciate your bringing back sleeves, I just can't handle them in a Kentucky summer.) I'm not a spray tan kind of girl, for many reasons, but also because my tan comes in spotted. You just can't duplicate freckle density in a salon. So vanity won over me, and I decided I needed a strapless swimsuit. Confession: I've never really had a fashion suit. I was a swim rat from a wee age (sorry for the "wees" ... Scotland got to me), beginning with early morning swim practice, then staying at the pool all day long, leaving only to make a sandwich or get quarters for nachos. When I was very small, I had a Big Bird swimsuit and a yellow bikini, but I'm pretty sure that from the time I was five years old on, all I ever owned were Speedos. Even today I always buy my suits from the Speedo clearance website, where you just input your size and buy whatever suit comes in your size. Colors and patterns just don't matter to me when it comes to swimsuits. It's all about function. Diving boards and bikinis don't mix, and I need to be able to get my flip on. FWT was a great shopping partner, as he is much more patient than I am. I generally hate any kind of shopping. On the bright side, years of avoiding fashion suits has made the shopping less dreadful than I always read it was in the "Cathy" cartoons. I still don't care about colors or patterns, though I'm pretty sure all that was left by the time we went shopping, were varieties of "old lady suits." In fact, we had a good laugh when FWT picked out several proper "old lady suits" for me to try on, just for one. I ended up with the one that FWT told me to get because I thought they all looked stupid and un-diving-board worthy. But really, I'm doing this all for him. I mean, surely he doesn't want to look at strap lines on his wedding day, right? Lately, many of the blogs I read regularly have been a little shy on the output. I know people are busy and most bloggers are writing for free, but I think I get overly excited when there is a new post. Then I start to think about my own blog, and I wonder if folks have been getting bored over here. I've been feeling more than a little stifled, and it shows. There are all kinds of chaotic things going on in my personal life, including an announcement I can't wait to share with you all (no, I'm not pregnant, though last week, I heard a rumor I was). When a writer writes, s/he shouldn't really be trying hard NOT to say things. My zipped-lips on many a subject have made me a dull blogger, I am afraid. For that, I apologize. I'm going to get over myself here, and start writing for real again. I always say my favorite color is purple, but when I go to play croquet/Clue/accordion, I always pick the red playing piece. My favorite song is probably "Rhapsody in Blue," which was the question in Final Jeopardy last night (easy). I auditioned for Teen Jeopardy! when I was 14, but did not make it. I was/am an over-achiever. I played the cello for three years in elementary/middle school, but quit to join chorus. The cello is my favorite instrument. Today, I am terrible at it. I am dreadful at returning phone calls (sorry, friends). My schedule is just not typical office hours, and then I always get nervous when making a call. I would rather sing in front of ten million people than for one of you in my living room. I could live on broccoli, brussels sprouts, and watermelon. Swimming is my favorite exercise because you don't noticed you're sweating. Speaking of that, I'm off to the pool. In the summers, I teach swim lessons over at Lakeside, and I've got some wee ones awaiting my expertise. Whenever I get home from a long trip, I have one overwhelming desire: to cook. Weeks on the road mean weeks of rich, delicious, restaurant meals. I'm not complaining at all, but after a while, you start to crave a simple bowl of vegetables. After weeks of Scottish breakfasts, baked potatoes loaded with butter and various toppings, steak fries, risottos, creamy pastas, afternoon snacks of brie and baguettes, and deep-fried fill-in-the-blanks, all I wanted was a piece of fruit. Thankfully, FWT knows me well, and he went to the Farmer's Market before picking me up from the airport, leaving our kitchen is stocked with fresh ingredients. The first night, FWT cooked fresh vegetables with homemade pasta (yes, flour, eggs, and a pasta machine). Last night I made a tomato sauce with fresh herbs, although I had to use canned tomatoes not being tomato-season just yet. This morning, it was a farm egg with fresh dill from the garden. I thought I'd make a spring vegetable soup today, but instead it's Matzoh Ball soup. FWT isn't feeling well today, so that seemed like a better choice. I can't tell you how much I'm looking forward to meal planning this week. I also know my eyes are not only bigger than my stomach, but bigger than our refrigerator. It's so tempting to buy everything at the grocery store. What's your favorite vegetarian recipe for this time of year? Soup? Casserole? Great veggie-burger recipe? I'm itchin' to cook, so bring it on, friends. It seems that I'm not the only person to have had a long layover in Amsterdam. There are clearly worse places to have a long layover. In pondering that deeply, it may actually be the absolute best place to be stuck for a night -- and not for the reasons that you may be thinking. It's a small city, and it's extremely accessible by public transportation directly from the airport for very little cost. So tonight, I'm grabbing a train, and renting a bicycle, and pedaling all around town. I'm going to walk the canals, browse the tulip gardens, go to the hemp museum, and window shop in the Red Light District. Well ... no. I just lied to you. I have hit a wall. This tour has been tiring, and I barely slept last night driving home late from our last show. And when I was browsing for a place to crash tonight on the discount internet sites, I got a killer deal at the Crowne Plaza. The only problem is that it's the Airport Crowne Plaze, about five minutes from the airport. That wouldn't typically be an issue, considering I could still hop a train to City Centre fairly easily. But when I saw my King Size bed and a hotel room three times the size of my bedroom at home ... and a piece of chocolate and sparkling water waiting for me ... and a stocked minibar ... and room service ... and the realization that i have to be back at the airport in less than 7 hours. Well, I guess I'm not the adventurous one I'd planned on being. Besides, I've been to Amsterdam before, and I'll be back here in the fall for real. And really, I was only ever after a wander through town and a chocolate waffle. I'm sure they've got those in room service.